As we enter Holy Week, the Church offers many traditions that help us better understand God’s plan for salvation history. In particular, the Triduum — the three days marking the Passion, Death and Resurrection of Jesus — is rich in beauty and meaning. This Triduum is celebrated every Sunday, in a smaller way, as we walk through the Passion, Death and Resurrection of Jesus in the Mass. Here are a few of the many liturgical traditions and devotions offered during Holy Week. The Church has had a long tradition of covering crosses, statues and other sacred images. Sacred items typically are covered in a simple, opaque violet cloth. The present edition of the Roman Missal encourages the practice of covering crosses and images throughout a church during the last two weeks of Lent, starting with the fifth Sunday of Lent, otherwise known as Passion Sunday. The Roman Missal notes that crosses should remain covered until the end of the Celebration of the Lord’s Passion on Good Friday, but the images remain covered until the beginning of the Easter Vigil. This period was called Passiontide to denote the heightened intensity of the Lenten season as we approach the holy days of our Lord’s Passion, the Sacred Triduum. Veiling statues and other sacred images stems from the Gospel reading of Passion Sunday (John 8:46-59), at the end of which the Jews take up stones to cast at Jesus, who hid Himself away, no longer walking openly among the people. Another reason for veiling is that Christ’s divinity was hidden when He arrived at the time of His suffering and death. The images of the saints are covered because it would be improper for the servants to appear when the master is hidden. 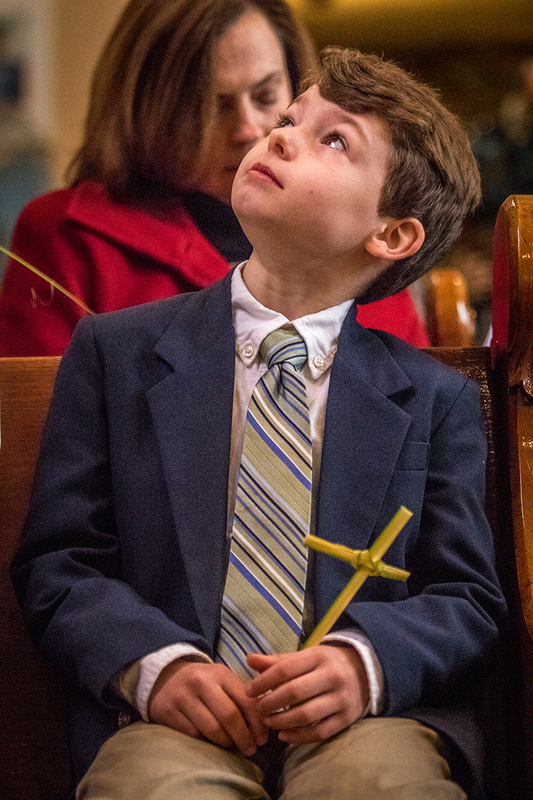 Jacob O’Hanlon held a palm woven into a cross by his sister Melanie at Mass at St. Mary of Victories Church on Palm Sunday in 2016. A common tradition on Palm Sunday is to make crosses from the palm branches received. These palms should be saved until next year and given back to your church to be burned and made into ashes for Ash Wednesday. 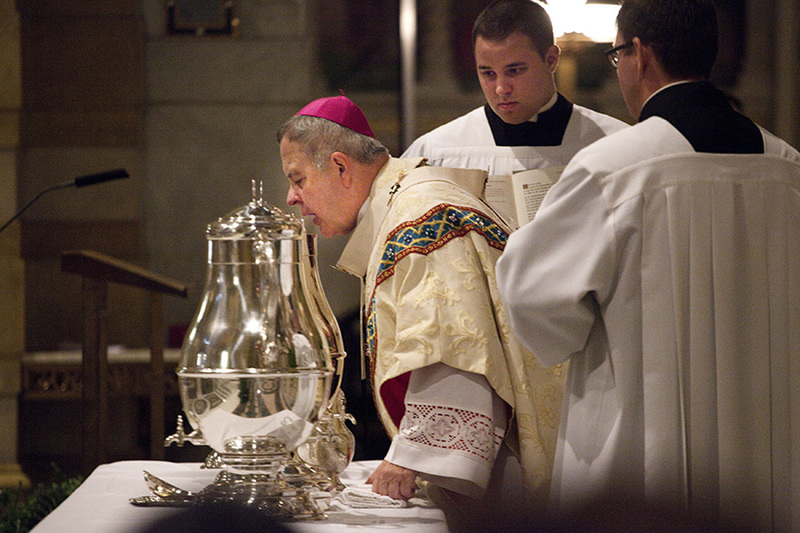 Archbishop Robert J. Carlson breathed onto the oils at the Chrism Mass on Holy Thursday in 2014. The oils were blessed at the Mass and were sent to parishes throughout the archdiocese for use in sacraments. On Holy Thursday, the priests of the archdiocese gather at the Cathedral Basilica of Saint Louis to celebrate the Chrism Mass, which recognizes the unity of priests with their bishop. During this Mass, Archbishop Robert J. Carlson will bless the three oils that are used for the administration of the sacraments throughout the year: the oil of catechumens (oleum catechumenorum or oleum sanctorum), the oil of the infirm (oleum infirmorum) and holy chrism (sacrum chrisma). After the Chrism Mass, the sacred oils are distributed to parishes in the archdiocese. The oils are to be received by the parish with a simple rite, just before the Mass of the Lord’s Supper. The oils should be kept in a place visible to the faithful, near the baptismal font. The Chrism Mass is an ancient tradition that dates back to the early Church. As part of liturgical reforms in 1955, Pope Pius XII called for a special Chrism Mass, separate from the evening Mass of the Lord’s Supper. At the end of the Mass of the Lord’s Supper on Holy Thursday, nearly everything is removed from the altar and sanctuary, including any linens, candles and statues, in order to demonstrate the bareness of the cross. The tabernacle also is emptied, with the door left open — a reflection of the emptiness of the world without Christ. The altar represents Christ, therefore stripping the altar reminds us of when Jesus was stripped of His garments. Psalm 21 (“Deus, Deus meus”) is often recited, which includes a description of the Roman soldiers dividing His garments among them. While there isn’t a Mass on Good Friday, a white linen is placed on the altar for the last part of the celebration of the Passion of the Lord. Afterward, the altar is stripped, again privately, with the exception of a cross and candles left on the altar. At the conclusion of the Mass of the Lord’s Supper on Holy Thursday in 2015, Archbishop Robert J. Carlson knelt before the altar of repose where the Eucharist was placed after the altar was stripped. The altar of repose is used to reserve the Eucharist that was consecrated during Holy Thursday at the Mass of the Lord’s Supper. The altar is separate from the main altar of a church. The reserved Eucharist is used for the liturgy on Good Friday. Mass is not celebrated between the time of Jesus’ death and resurrection, which is why communion hosts may not be consecrated on Good Friday. Some parishes hold a procession on Holy Thursday to bring the Eucharist to the altar of repose, which is usually decorated to represent a garden —the Garden of Gethsemane. Some Catholics make it a tradition of visiting the altars of repose at seven churches on Holy Thursday evening. 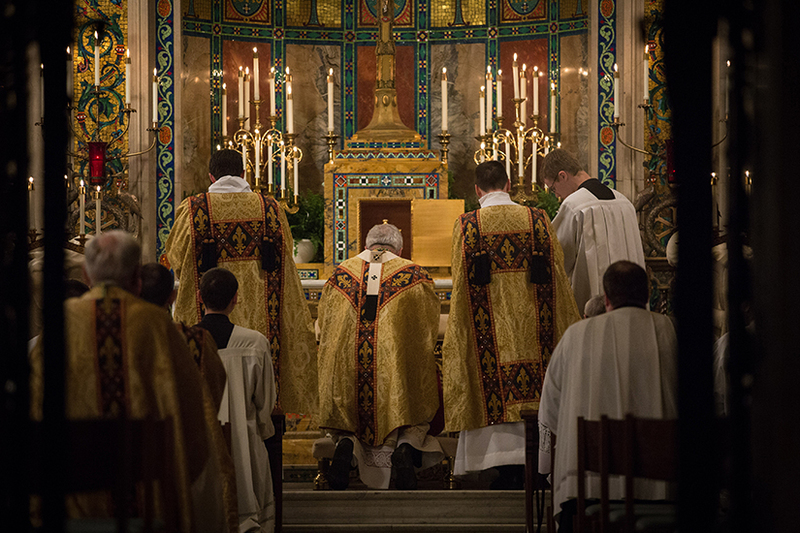 This typically takes place after the Mass of the Lord’s Supper. Catholics will visit seven churches to pray before the Blessed Sacrament in each church. The tradition dates back to St. Philip Neri around 1553 in Rome. After Mass, he and others would travel by foot to churches, where they would pray for a short time, before moving on to the next church.The tradition has diminished in recent decades; however, some parish groups are making it a tradition to carpool or rent a bus to travel to churches for prayer. Some groups conclude the pilgrimage with a late-night meal, before the fasting of Good Friday begins. Adam Wright built a crotalus at his workshop in St. Louis April 5. The crotalus will be used at Christ Prince of Peace Parish this year instead of bells during the Triduum. This is a liturgical instrument that is used as a noise-maker during the Easter Triduum. In the Roman Rite, altar bells are not to be rung after the Gloria during Mass on the evening of Holy Thursday; the bells should not be used again until the Gloria on Holy Saturday. 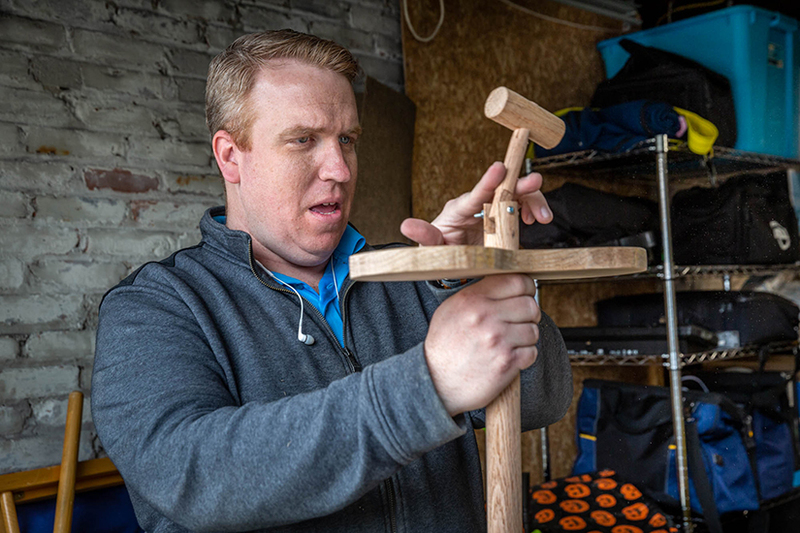 The tradition of using a crotalus, a wooden noise-maker in its place, has made a comeback in some churches in recent years. The word “crotalus” is a Latin term that comes from the Greek word “krotalon” (κροταλον), meaning “rattle.” The noise serves as a way to indicate the noise typically used by the bells, but with a more somber tone. As a side note, crotalus also is a genus of venomous pit vipers, better known as rattlesnakes. The hearse used by the Discalced Carmelites in St. Louis for their Tenebrae liturgy in 2018. The Tenebrae service is typically held before dawn on Holy Thursday, Good Friday and Holy Saturday. The prayers of Tenebrae include the Liturgy of the Hours: Office of Readings and Morning Prayer (formerly Matins and Lauds), commemorating Jesus’ passion and death. The popularity of the service has faded in recent decades, but some parishes are returning to the tradition. Tenebrae in Latin means “darkness” or “shadows.” The readings are taken from the Old Testament and point to how Christ saved all people from death and sin (darkness), and brings life (light) to the world through His sacrifice on the cross. 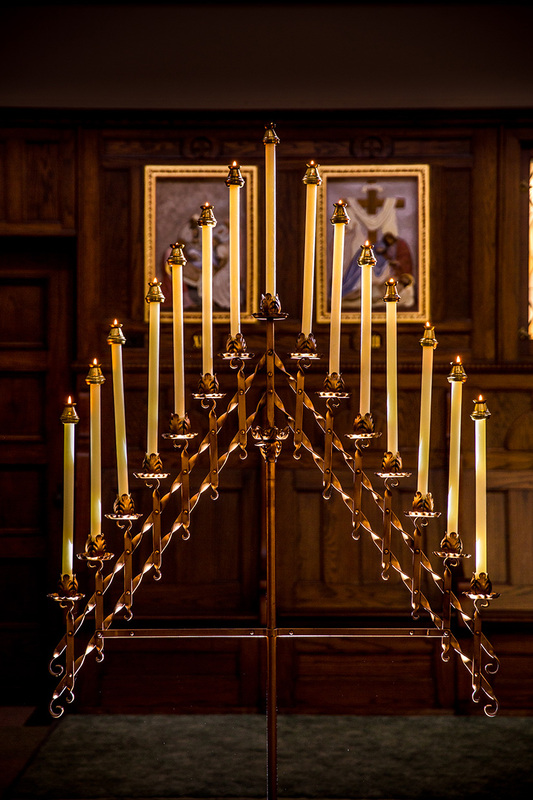 A Tenebrae service also sometimes incorporates a hearse, a triangular candelabra typically featuring 15 candles. During the service, the candles on the hearse are extinguished one by one, until only one — the Christ candle — remains. The Christ candle is carried out, leaving the room in total darkness and silence. Those participating in a Tenebrae service punctuate the silence with the strepitus, which in Latin is roughly translates as “loud noise.” Some describe the noise as symbolizing Jesus’ death, or as the earthquake that was said to have happened at the moment of His death. Others have described it as the convulsion of nature when Christ died, or the sound of the tomb’s door closing. The Reproaches, also known in Latin as Improperia, are a series of antiphons and responses expressing the remonstrance, or objection, of Jesus with His people. Songs and hymns are typically not sung on Good Friday, as it is a day of mourning in remembrance of Christ’s death. The Reproaches are a solemn way to remember Jesus’ sorrow on the cross, and to recognize the part that our sins have played in putting Him on the Cross. 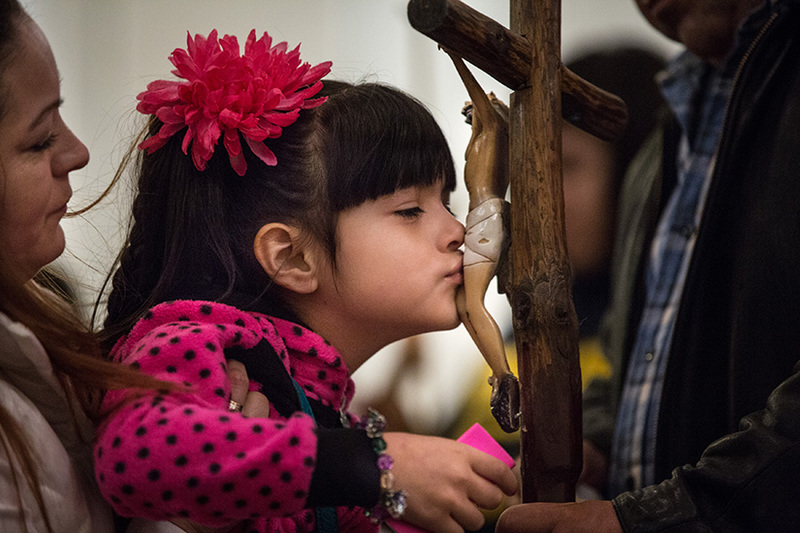 At Good Friday services at Our Lady of Guadalupe Parish in Ferguson, 5-year-old Maria Jose Hernandez venerated the cross as she was held by her mother Emma Hernandez. After the celebration of the Lord’s Passion on Good Friday, churches may offer veneration of the cross. The ceremony of venerating the cross was first instituted in Jerusalem in the fourth century. The unveiling and adoration of the cross eventually was introduced into the Latin Liturgy by about the seventh or eighth century. During the veneration of the cross, the Reproaches may be sung. The faithful are then invited to reverently venerate the cross and spend time meditating on the mystery of our salvation.